If a person crosses his or her arms during an internal theft interview and does not talk, does it mean they are lying, or are they simply listening to you? Interview and interrogation training often dictates that if you see someone cross their arms, it indicates that they are not open-minded. This supposition may be true, but to what extent and, most importantly, at what precise moment? I have been working in security for over twenty years. I have examined thousands of suspects, witnesses, and victims. In 2009, I conducted over 300 interrogations, 200 of which ended with convictions and arrests. My success is owed to the fact that I followed self-improvement courses in interview and interrogation training techniques and body-language interpretation. Synergology — the study of nonverbal communication— is undoubtedly what contributed most to enhancing my interrogation approach by allowing me to understand what messages the body is actually sending and to make a comparison with what the person is saying. After an interrogation, you may have thought, “I’m convinced that he is guilty, but I don’t know why.” With a knowledge of synergology, you can hone in on what about the interrogation, exactly, gave you cause for suspicion. One of the worst things an investigator can do during an interrogation is to place a table between themselves and the interviewee. If you do, you risk losing a lot of interesting information, such as that conveyed by a person crossing their legs. Are their legs pointing towards the door? If so, the person probably wants to leave. Is the person on the tip of their toes? If so, it means they want to exit. Is the person micro-scratching their leg with their left-hand forefinger? With synergology, you can see and detect whether the interviewee is lying or telling the truth during interrogation. The way the person is sitting on the chair, how they say “No” with their head, how the feet are positioned, and signs of micro-scratching, as well as information related to the hands, are all useful indications of the individual’s involvement, guilt, or innocence. This is the major difference between synergology and the popular TV series “Lie to Me” based on psychologist Paul Ekman’s theories. In synergology, body language includes the entire body. In the TV series, only the face’s micro-reactions are considered. More importantly, synergology pays significant attention to the body’s movements and motions from left to right, and vice versa. Several interview and interrogation training techniques will teach the investigator how to lead someone to open up or talk. In synergology, the technique is based on observation, as the body reveals what the mind is really thinking. Consider the well-known case of Suzanne Smith, the woman who killed her two children to please her new lover. The many experts who studied her face noticed that one side of her face showed unusual features. For a synergology-trained investigator, it is obvious that the left side of her face is smiling while the right side expresses sadness. The left side represents true inner feelings and the right side, what the person is trying to show. In synergology, examining the left and right sides is particularly important. Albert Mehrabian (1972) was the first researcher who truly attempted to understand nonverbal communication. Nonverbal signals are the most important part of human communication. 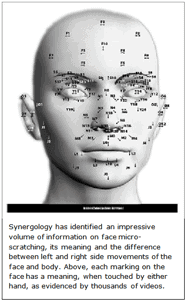 Synergology is focused entirely on those nonverbal cues. A trained synergologist can play back the video of an interrogation on mute and determine whether the subject is being truthful. Let us revisit our initial question—if a person crosses their arms and does not talk during an interview or interrogation, does it mean they are lying or simply listening to you? In fact, when a person speaks, their hands should move while expressing their thoughts. However, when someone is listening, there is nothing wrong in crossing arms or legs; the investigator trained in body language will be able to identify this invaluable information. Synergology can precisely explain over 2,500 unconscious movements the body engages in while communicating. This article was originally posted in 2012 and was updated December 12, 2017.